Heat oven to 350°F. 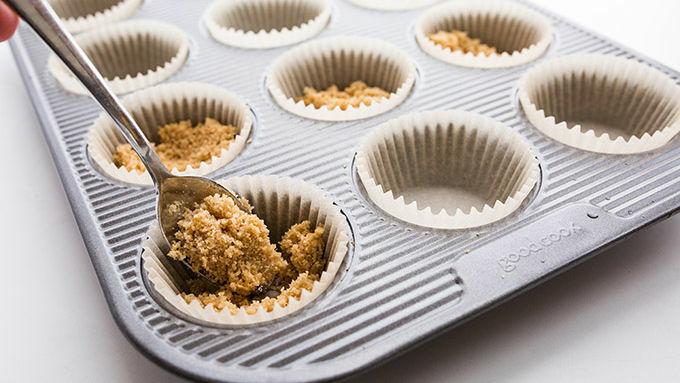 Line a 12-cup standard muffin tin with parchment liners. Place 1 1/4 cups Honey Nut Cheerios™ a blender or food processor and pulse until you get fine crumbs. Pour crumbs into a bowl and mix with butter and sugar. Press crumb mixture into the bottom of each liner to form crusts. In a large bowl or stand mixer, beat cream cheese until fluffy, add eggs, beating to incorporate, add sweetened condensed milk and 1 tablespoon amaretto. The mixture will be quite runny. Pour in each liner, on top of crust. 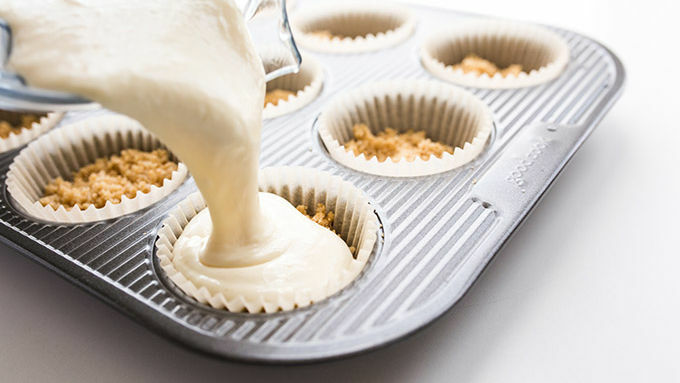 Bake for 16-19 minutes, or until the center of each cheesecake has set. Remove and cool completely. In a medium saucepan, toast almonds over medium-high heat, just until golden brown. Transfer to a small bowl. Add honey to the pan and cook, stirring constantly, until boiling. Boil for 1 minute. Remove from heat and stir in toasted almonds and amaretto. 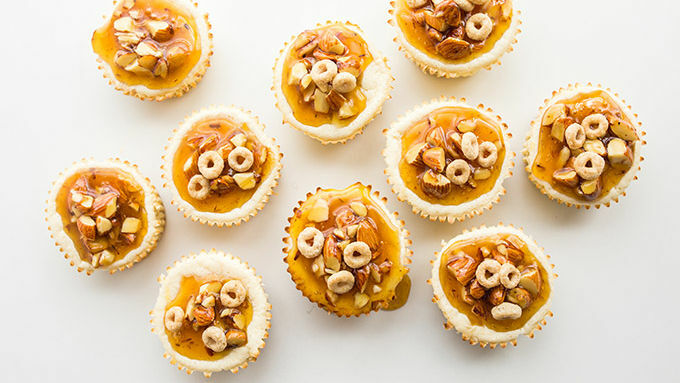 Drizzle honey-caramel and almonds over cheesecakes just before serving. The irresistible flavor combo of honey and nut, now in cheesecake form. If you’ve ever, ever, like, ever ever craved a bowl of Honey Nut Cheerioes™ as if it were air, water and breath, yay you! You must be my soul human. And together, we must celebrate the wonderful perfection that is honey. And nut. And Cheerios. That flavor combo. It’s just craveable. And now, I’ve gone and cheesecaked it. And it is so perfect, my heart hurts with gladness.Because, last week, I gathered a few basic baking must-haves into a collective pile. I mean, super basic. Egg, butter, cream cheese, sweetened condensed milk, Honey Nut Cheerios. The result, my dear fellow Honey Nut Cheerios™-loving humans, is honey-caramel-crunchy-almond perfection. And if you think that’s just too many hyphens all at once, just you wait until we top it all off with a smattering of Cheerios. 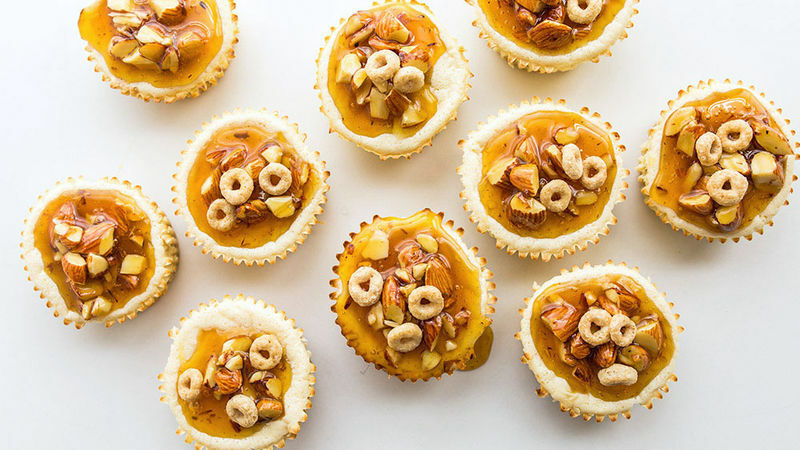 Honey-caramel-crunchy-almond-oaty-Cheerio happiness. It just really is.